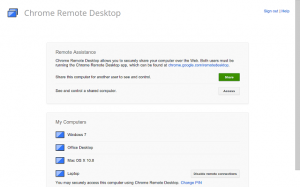 Chrome Remote Desktop is a remote desktop software tool developed by Google that allows a user to remotely control another computer using a Chromoting protocol developed by Google. It transmits the keyboard and mouse events from one computer to another, relaying the graphical screen updates back in the other direction, over a network. Chrome Remote Desktop requires the use of Google Chrome, along with the installation of an extension from the Chrome Web Store. 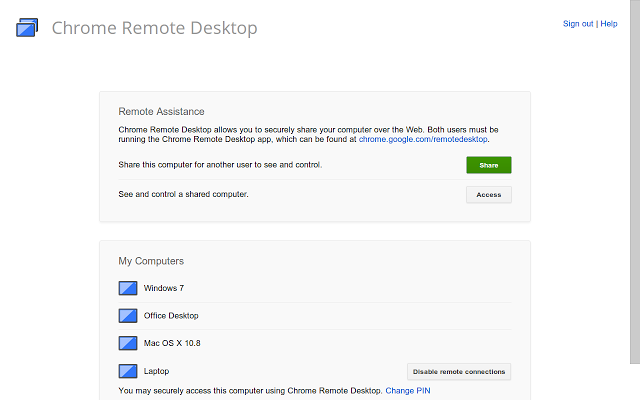 Chrome Remote Desktop supports both a remote assistance mode, allowing a user to control another person’s computer as well as a remote desktop mode where a user can connect to another one of his or her own machines remotely. It utilizes VP8 video to display the remote computer’s desktop to the user. Under Windows it supports copy-paste and real time audio feed as well.